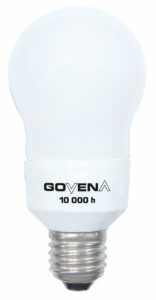 Non-dimmable – Govena Lighting S.A.
*The fluorescent lamp can be turned on and off 500,000 times (150 000 times for 15W). The number of cycles was measured in accordance with Commission Regulation (EC) No. 244/2009 of 18 March 2009. If the fluorescent lamp is broken, carefully collect the broken glass. The broken glass and other fluorescent lamp elements must not be disposed of together with other waste (e.g. municipal waste) but must be handed over to a Company which collects and recycles waste electrical or electronic equipment. Used or defective lamp should be handed over to a Company which recycles waste electrical or electronic equipment.